A Calia project is just downstairs below Calia at Emporium. I thought their menu would also be japanese inspired. But it’s something different. 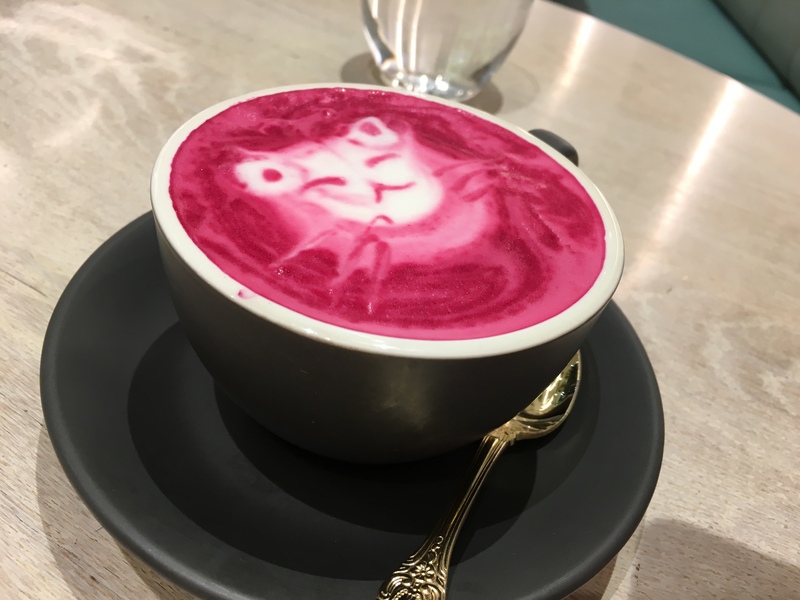 What we enjoy, is the beetroot latte. It doesn’t sound appealing but they’ve done it to my liking! light beetroot aftertaste, but not losing the milkiness of lattes. I’m not a big fan of beetroot but I enjoyed it so that says something! Not to mention they have carried Calia’s famous latte art to Blush! Bonus. I ordered seafood with squid ink pasta. I do have to admit that I didn’t have the dish immediately – I was too busy talking. So the food was cold. The linguine was al-dente which is perfect! but the seafood was chewy. It’s very hard to make calamari cooked soft and tender – unfortunately it was overcooked. J had clam miso pasta (we picked linguine). When I tasted it, the flavour was quite bland. Good for the healthy eaters like J, but I like my pasta sauce. Unfortunately I couldn’t taste the miso – more miso needed maybe? Especially knowing that clams don’t give a lot of juice so I always have it the asian way – with strong black bean sauce or fish sauce. I think the dish was going for the clam’s freshness, but the flavour of the clams for some reason had disintegrated. To clarify, At the time we tried Blush, their menu had not been confirmed. They are consistently testing their dishes before the official menu. So I think it’s good to keep trying. To be honest, I’m a big fan of Calia, but Blush was a bit of a disappointment – the Beetroot latte was great though – recommended. I reckon they should publish their Beetroot latte on their Calia menu and continue to test more western inspired dishes. Keep it up! I’ll try their sweets next time!